By systematically integrating advanced multi-touch technologies into its control panel and panel PC portfolio, Beckhoff has provided machine builders, manufacturers and other industries with forward-looking operator interface concepts for years. With the company’s new CPX control panel series, applications in hazardous areas, classified Zone 2/22, can now also benefit. The high build quality and robust aluminium enclosures ensure reliability and durability in harsh and potentially explosive environmental conditions. This delivers significant advantages in terms of operation, look and feel, and design to applications in the process industries. Beckhoff offers a system-integrated solution for explosion protection with the addition of a new and extensive portfolio of explosion-proof compon-ents. These solutions enable barrier free concepts through to Zone 0/20. 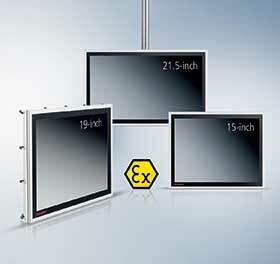 In addition to the control panels and panel PCs in the CPX series, Beckhoff has also introduced the new ELX series EtherCAT terminals with intrinsically safe interfaces for field device connection through to Ex Zone 0/20, as well as TwinCAT control software with numerous interfaces specific to process technology. The CPX portfolio offers a wide selection of screen formats, sizes, installation options and features. This means that process industry applications can now also benefit from advanced capacitive multi-touch technology, enabling the realisation of intuitive and feature-filled operating concepts. To ensure that all application requirements are fulfilled, both the CPX29xx and CPX39xx series offer control panels for integration into control cabinets, as well as IP65-rated standalone panels for mounting arm installation. The same applies for the fanless panel PCs in the CPX27xx and CPX37xx series. Equipped with heat resistant, energy saving Intel Atom processors, they ensure reliable and high-performance system control.